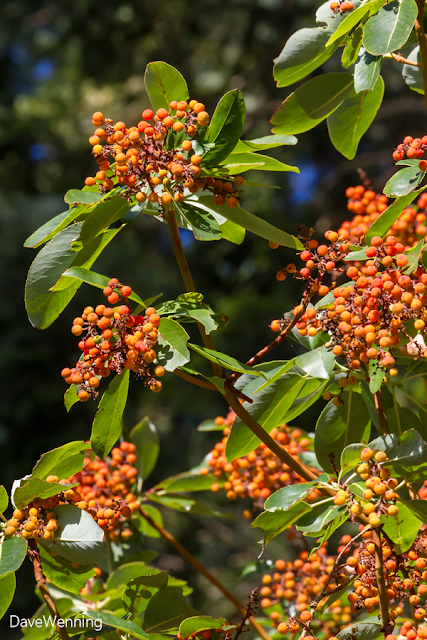 Last month, I posted some photos of my fruiting Madrona Tree. As I mentioned then, this is the first time I have seen this happen. I have no idea how this will progress. It has now been about three weeks and the berries have swollen a bit. The clusters now sport a bright orange color making the tree look decorated for Halloween. 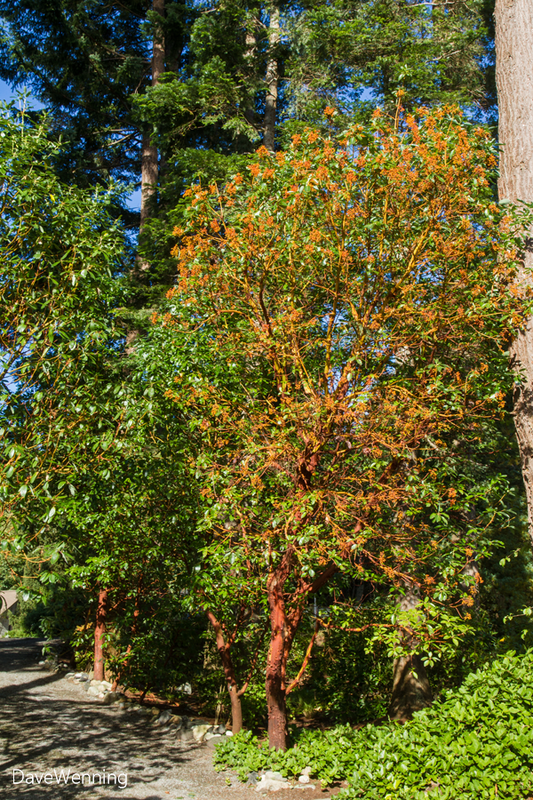 In the morning sun, this Madrona really stands out from the crowd right now. In this group that lines my driveway, it is the only one bearing fruit. The berries resemble clusters of small, orange grapes. This morning, the branches were alive with chickadees, perhaps two dozen in number. They did not seem interested in the fruits. Instead, they come for the insects and spiders that make their home in the tree. 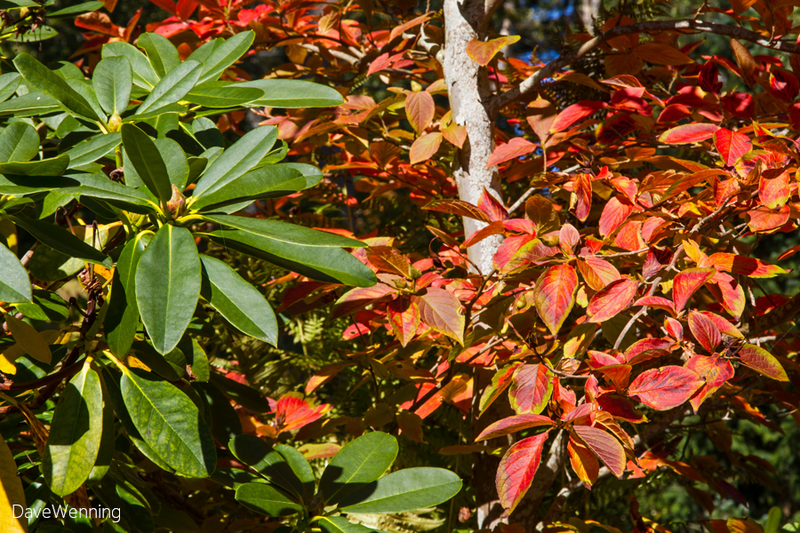 Meanwhile, my Japanese Stewartia (S. pseudocamelia) has also taken on its autumn attire. 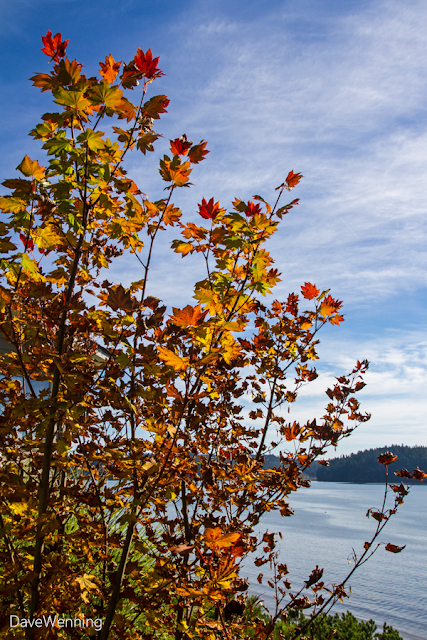 As fall progresses, the leaves will become more burgundy colored. Like the Madrona, it has interesting colored bark that exfoliates. It will display pastel shades of gray, pink, green and beige through the winter. 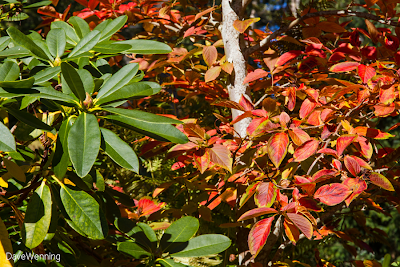 Looking closer, autumn Stewartia leaves are multicolored in shades of red, orange, purple and green. Like camelias, they are members of the Tea family. In the spring, they produce large, white, camelia-like flowers. 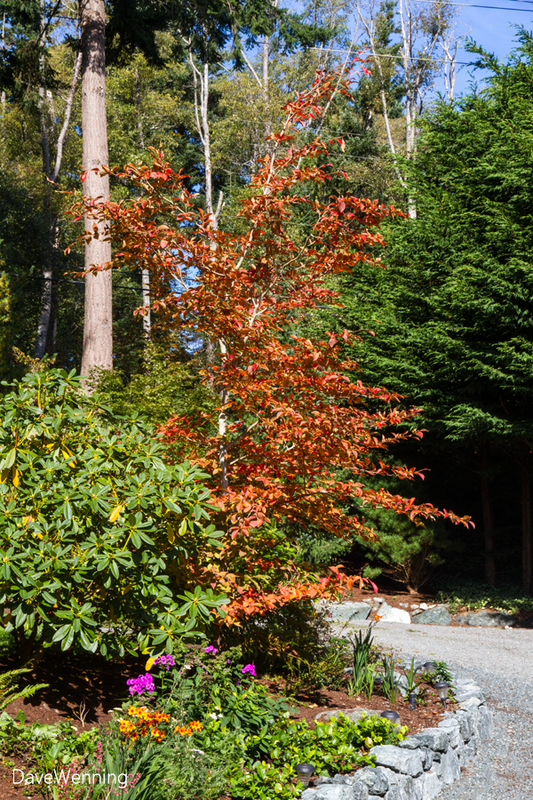 I cannot pass up an opportunity to include the native Vine Maple (Acer circinatum) in its fall colors. My Japanese Maples are just beginning to turn. They should be looking their best towards the end of the month. 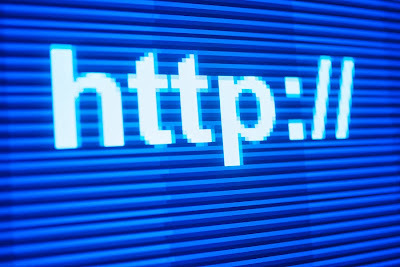 Finally, please note that the domain name for this blog has changed to http://www.fidalgoweather.net. Followers may want to update your blogrolls or RSS feeds as appropriate. There is a bit of history behind this name. Beginning in 2006, it was the domain name of my first weather website. It was hosted by Microsoft and used the Office Live Small Business platform. Following Microsoft's usual pattern, however, in 2010 they announced the service would be discontinued. At this point, I moved the site to Blogger with the domain fidalgoweather.blogspot.com. 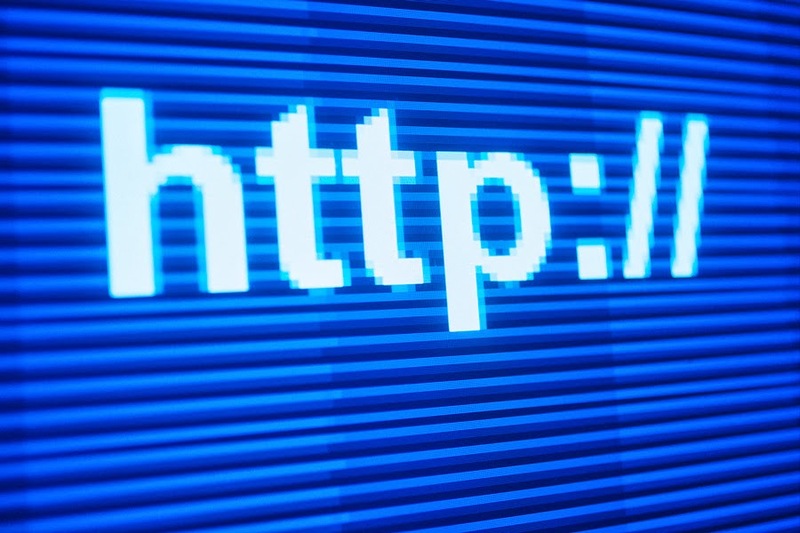 While either address will work, using the new domain name will avoid the redirect. I love madronas! Wonder why that one tree decided this year to fruit? Have you researched that? Interesting, have you left blogspot? Or just posting new things there? I think about migrating to WordPress, but it sounds like a huge hassle.